With so many cosmetic dentists in the Hoboken, New Jersey area competing for your business, choosing the right cosmetic dentist can be an overwhelming task. It is important to evaluate your options carefully to ensure you choose a cosmetic dentist who understands your goals and has the extensive experience necessary to deliver the beautiful results you deserve. Pay attention to the following factors when evaluating a potential cosmetic dentist to ensure you find the right person to address your unique needs. It is important to evaluate your cosmetic dentist’s education, training, and experience. Cosmetic dentistry is both a science and an art. As a result, a good cosmetic dentist must have the skills and background necessary to blend the technical and aesthetic aspects of these procedures to deliver results that are both beautiful and functional. You should look for a cosmetic dentist who has demonstrated a commitment to continuing education, particularly in the field of cosmetic dentistry. Completing course work at the Las Vegas Institute for Advanced Dental Studies (LVI), the premier cosmetic dentistry training institution in the country, is a good indication that your cosmetic dentist has the proper background to deliver the results you deserve. Ultimately, you will want to work with a cosmetic dentist who truly cares about helping you achieve the smile of your dreams. You can get a feel for the level of personalized care you can expect to receive from your initial consultation. Does the team make an effort to make sure you are comfortable from the moment you walk into the office? Does the cosmetic dentist spend as much time as needed to listen to your concerns, answer all your questions, and explain all your options? Dr. Frank DePaola has been providing patients in the Hoboken and Hudson County areas with exceptional cosmetic dentistry results for more than a decade. During that time, he has devoted a considerable amount of time to continuing education, completing coursework at LVI. 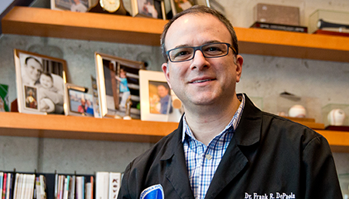 In the fall of 2015, Dr. Frank will earn his fellowship with LVI. This prestigious honor has been bestowed on less than 500 dentists worldwide. Dr. Frank firmly believes that a strong doctor/patient relationship is the key to helping you achieve your desired results. He is committed to delivering the highly personalized care you deserve, and he will work hard to earn your trust from the moment you first walk into our office. 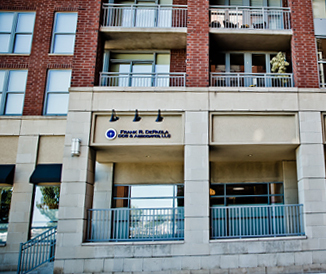 His state-of-the-art dental office utilizes some of the most advanced technology available to ensure you receive the highest quality care in the most comfortable manner possible.